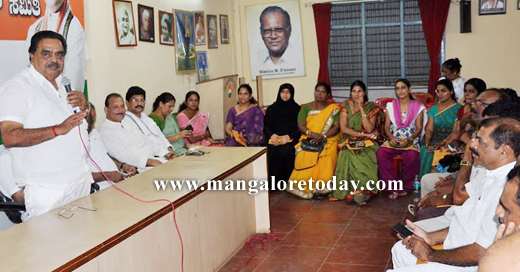 Mangaluru, Dec 16, 2015 : The greed for power in politicians leads to rebellion or defection to other parties, said Pratapchandra Shetty, Congress candidate for the upcoming Legislative Council elections from Dakshina Kannada /Udupi constituency. 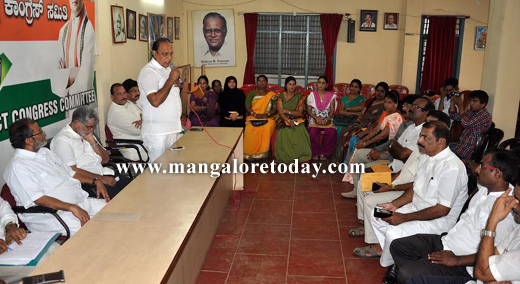 He was addressing an election campaign meeting participated by Corporators of Mangaluru City Corporation at the District Congress Office on December 15, Tuesday. Shetty while referring rebels Harikrishna Bantwal and Jayaprakash Hegde as independent candidates, he said if Harikrishna was in the party since several years, the party has given an opportunity to Hegde to contest four elections in a six year period. "It is not proper on their part to blame us and Oscar now," he said. DK District in-charge Minister B Ramanatha Rai who also spoke said the MLC election is not an election where speeches can be converted into votes. The candidate has to go around a lot to win this election, he further added. Vinay Kumar Sorake, State Minister for Urban Development, in his address, said Pratapchandra Shetty was a candidate who was chosen unanimously by the party. Moidin Bava, MLA of Mangaluru North, Ivan D’Souza MLC, Jacintha Vijay Alfred, Mayor, Purushottam Chitrapur, Deputy Mayor, UR Sabhapathi, Congress leader, Kodijal Ibrahim, in-charge President of District Congress and others were present.